When it comes to pets, most people will spare no expense to be sure their pet has a good life, but one Chinese businessman has done one better and spared no expense in making sure he has a good pet. An unnamed Chinese businessman from Northern China has opened his pocketbook wide in search of a pet, and he’s picked up what may be the most expensive puppy I’ve ever seen. An 11-month-old Tibetan Mastiff named Hong Dong, or Big Splash, sold for a staggering $1.5 million dollars. Well, if you can say anything about a dog that fetches $1.5 million, it’s definitely going to pay a lot of salaries. Still, the dog may be a bargain in the long run. Apparently Big Splash is a perfect specimen of his breed, which is famous both for its size and its skill as a guardian, so that $1.5 million may become merely a down payment. 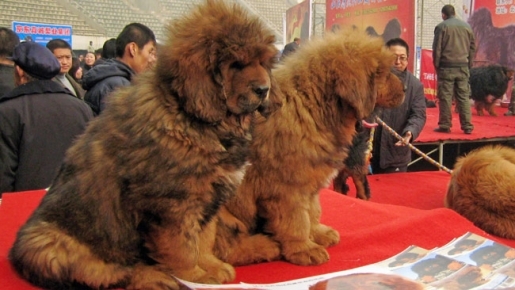 Tibetan Mastiffs can fetch stud fees of up to $15,000 per session. With that kind of potential profit, I imagine Hong Dong is going to live off of nothing but $197-per-pound ham.